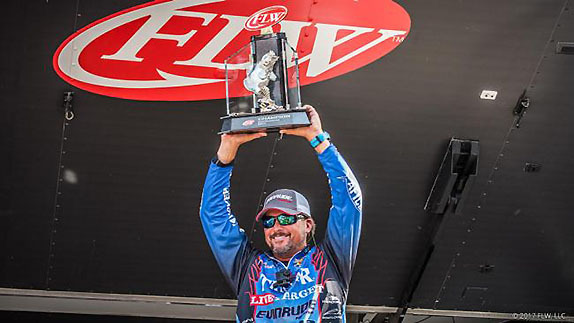 Scott Martin captured the win at the Lake Cumberland FLW Tour in 2017 after leading the event following day 1. Editor’s note: This is the second in a two-part series analyzing how day-1 leaders in Elite Series and FLW Tour events have ultimately fared at the conclusion of each tournament. Part 1 examined the Elite Series. For years, BassFans have tried to make apples-to-apples comparisons between the Bassmaster Elite Series and FLW Tour in an effort to determine which trail was better. The debate over which circuit had the stronger field sounded like the all-too-familiar Chevy-vs.-Ford-vs.-Dodge arguments that still rages among pickup truck owners. When it came down to it, it was a difficult evaluation to make. The Elite Series got rid of co-anglers in 200x while the FLW Tour continued to feature co-anglers for at least a portion of each Tour event through the end of the 2018 season before announcing they’ll no longer compete in Tour events starting next year. The average size of an Elite Series field from 2006-18 was 102 boats while the Tour field has carried, on average, 50 more boats per tournament since 2010. Those two factors alone cannot be overlooked when trying to settle the debate. While it’s been difficult to draw top-to-bottom conclusions about the overall strength of one circuit versus the other, one thing that has remained consistent across both platforms is the importance of a strong start to a tournament. 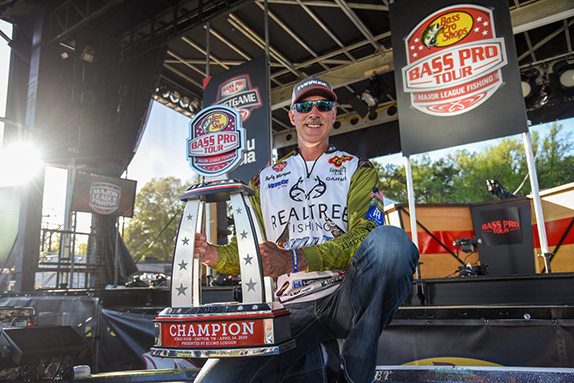 Last week, it was reported in this space that 23 percent of full-field, regular-season Elite Series points tournaments between the circuit’s launch in 2006 and 2018 were won by the angler who held the lead after day 1. Based on a similar BassFan analysis of the 63 full-field FLW Tour events where winners were determined by four-day cumulative weight totals between 2010-18, 20 of them were won by the angler who sat atop the leaderboard after day 1. That’s a 31.7 percent conversion rate. Does that make the Tour a stronger circuit than the Elites? Not quite, but it is noteworthy that the day-1-lead-to-win conversion rate is slightly higher on the Tour despite the two limiting factors mentioned above. Since 2010, four Tour anglers have converted a day-1 lead into a victory on multiple occasions. Scott Martin is 3-for-3 in such situations (4-for-4 is you count his win at the 2011 Forrest Wood Cup at Lake Ouachita). Mark Rose, Bradley Hallman and Jason Christie each have notched two wins over that span in tournaments where they led after day 1. > The average day-1 place of tournament winners between 2010-18 was 9.69. > The average finish of day-1 leaders has been 9.5. > The average day-1 deficit faced by the eventual tournament winner was roughly 2-12. > The average weight of a day-1 leader has been approximately 22-02 and the average winning weight over the time span examined was roughly 73-02. > Thirteen times, the winner was outside the top 15 after day 1. Also, there have been 13 instances of the day-1 leader finishing outside the top 15. > Jason Christie’s rally from 68th place after day 1 to win at Beaver Lake in 2013 represented the biggest comeback to record a victory over the 2010-18 timeframe. > Thanh Le was the only day-1 leader to ultimately miss the money cut. He dropped from 1st to 81st at the 2012 Detroit River FLW Tour Open. > On two occasions – both occurred in 2017 – the tournament winner erased a day-1 deficit of 10 or more pounds to claim victory. Mark Rose rallied from 13-03 back (41st place) at Lake Travis while Bradley Dortch came from 10-07 behind (29th place) at the Harris Chain of Lakes to capture his first Tour win. When asked about his philosophy on day 1 of multi-day tournaments, Martin says a good start is important to him because it spawns more confidence as the next day, two – or three – unfold. None of Bryan Thrift's Tour wins have come in events where he's held the lead after day 1. He also believes the reputation of the day-1 leader can also be a factor in the ultimate outcome of the event. “It also does a little bit to the competition if you’re known as someone who can close or will threaten for a win,” he added. “Both of those are advantages. That lead gives you the ability to not so much protect it but to experiment a little bit to try to expand. When you’re leading, you can go catch a good bag (on day 3) knowing you have a cushion and you might find something that can benefit you or eliminate something that isn’t working anymore. Martin says at just about all of the tournaments he’s won after holding the day-1 lead, he could sense he was on or around the winning fish very early in the competition. He distinctly remembers utterly a similar comment early on at the Potomac River FLW Tour in 2012. He said it’s tough to describe the feeling of knowing that he’s going to be a contender at a given tournament. It’s not something he can plan for or strategize around. It just happens. Martin’s day-1 strategies over the years hasn’t changed much. Based on his practice, he’ll plan out moves in his head and make changes according to conditions and what he thinks could develop during the tournament. “On day 1, I try to get to the place where I feel I can win,” he said. “Everybody does that. Nobody goes out to catch a limit then moves. It’s about getting to the best stuff and catching all you can. 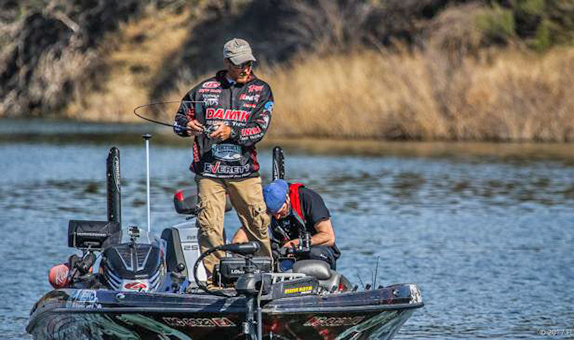 In FLW, we have more boats so you get there and catch what you can and then manage it however you need to. Bryan Thrift has recorded five wins in full-field Tour events since 2010 and not once was he was the leader after day 1. His average spot on the leaderboard following the opening day of competition in those tournaments was 15.6. In the two events where he has been the day-1 leader, he finished 2nd (Lake Travis in 2017) and 11th (Beaver Lake in 2014). While he knows his consistency throughout a tournament ultimately leads to the chance at a win, he’d much rather be the hunted than the hunter over the course of a tournament. 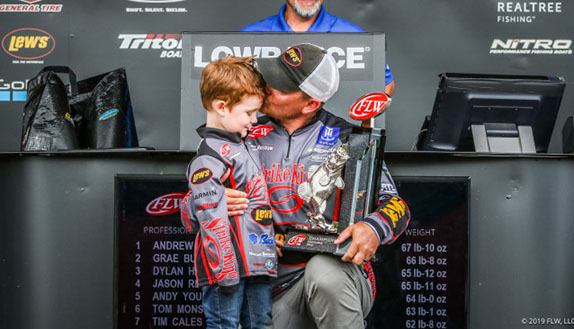 He said his win at Lake Eufaula in 2015 was the only one where after one day of competition, he felt he could win. He started that tournament more than 6 pounds behind the leader, in 14th place. 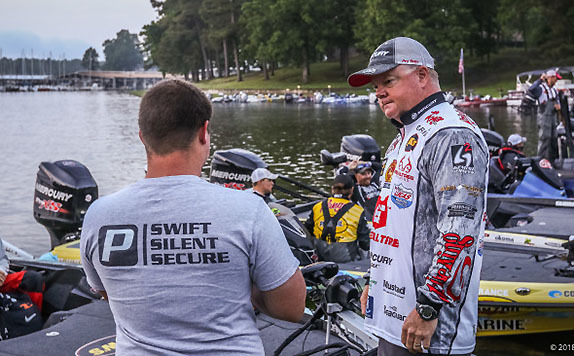 Thrift says, by the end of practice, he’ll usually have a good feel about what a decent stringer will weigh during the tournament and he’ll factor that into how he approaches day 1. He said it took him a few years to develop that mindset, rather than overfish areas at the start the of the event. Mark Rose has come from behind to win and also won after leading following the opening day of competition. His day-1 strategy will vary based on the venue, too. 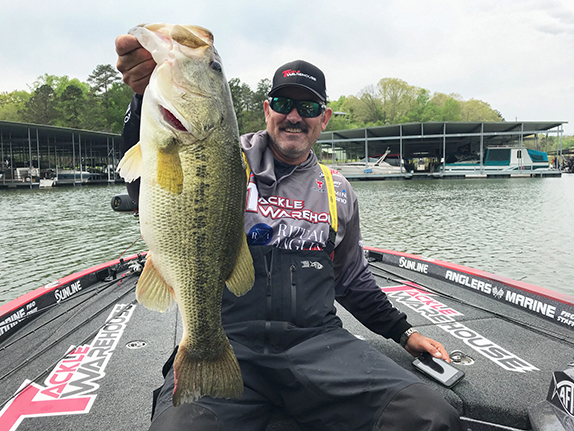 At a place like Lake Guntersville, where big fish and big weights are possible, he knows it’s possible to make up ground if he’s facing an early deficit. He also said it’s rare for him to pull back, especially on day 1. Three of the four Tour wins Rose has claimed since 2010 came on the Tennessee River and two of them – 2011 at Pickwick Lake and 2012 at Lake Wheeler – he led after day 1. He attributes his success there to his affinity for using his electronics to locate and target offshore schools of fish. “I took advantage of electronics and structure scanning maybe more than others,” he said. “Those schools were schools that were on special places and I was able to manage them for four days. There were times where people would say they saw me fishing that point. That’s because when I heard a boat coming, I’d started throwing a spook and start casting the other way. There were times when I’d have a 6-pounder on and a boat would come by, but I’d have my rod tip down and work it like I had a worm on. At both Pickwick and Wheeler, he caught more than 21 pounds on day 1 and wound up averaging more than 17 ½ pounds en route to wins at each. While he says a strong start is always important, there are other factors that come into play that he needs to be aware of. Case in point: Lake Travis 2017. Rose sat in 41st place after day 1 with 11-09. He averaged nearly 16 pounds over the final three days to claim the victory.